Developed from experience gained during our successful 12 and 24 hour record breaking attempts with a Venom Clubman Veeline,.and from participation in Clubman type races both at home and abroad and generally following racing practice. we have produced the Venom Thruxton 500 which is equally suitable for use on the road and in Clubman races. Fantastic acceleration coupled with a very high maximum speed and good petrol consumption are features of this machine which incorporates a cylinder head of new inlet port design and with modified valve angle to eliminate valve-touching in the event of an engine being inadvertently over-revved. The combustion sphere has a flatter form, whilst the inlet valve is increased in outside diameter to approximately 2" and seats on a radiused Austenetic iron valve seat. An inlet port of steeper downdraught and greater swirl angle is fed through an 1 3/8" racing G.P. Carburetter, giving considerably more power when used in conjunction with special cam followers and lightened valve gear. The heat treated crankcase has a new breathing system which makes for an extremely clean engine. 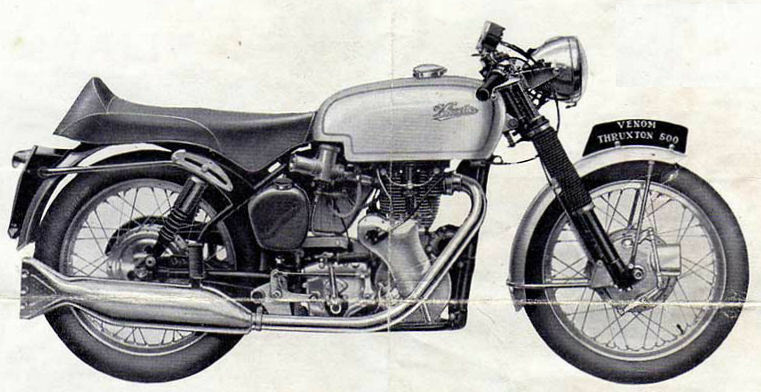 A manually controlled competition magneto is fitted as standard equipment, and the machine specification includes double leading shoe front brake with air scoop and drilled hub for cooling, telescopic forks with two-way damping and rubber gaiters, clip-on handlebars, ball-ended levers, rev counter and speedometer, separate chromium-plated headlamp (quickly detachable), chromium-plated headlamp brackets clipping on to the top of the chromium-plated fork stanchions, narrow mudguards, integral battery and toolbox on nearside to which is rubber-mounted the racing float chamber (Matchbox type), with provision for vertical adjustment, aluminium wheelrims, new rear mudguard stay, forward operation pattern gearchange lever, rear mounted footrests, new type rear mounted brake pedal, pillion footrests, dual seat with racing backrest, steering damper with wing nut adjustment, 3 00 x 19 in. ribbed front tyre. 3*50 x 19 in. studded rear tyre, rubber mounted oil tank, swept-back exhaust pipe, raised silencer. A special Dolphin type frontal fairing is available for this machine giving greater penetration and wider protection.